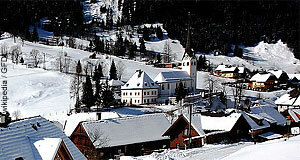 Muhr is a village in the Lungau area of Salzburg, in the very south-eastern most part of the province. Muhr has a population of approximately 570 and is divided into three hamlets. Muhr is known for a local custom, that of the Prangstangen: Once a year in early summer, thousands of Alpine flowers are picked and arranged into long poles (the very Prangstangen). This custom is unique for Muhr and the neighbouring village of Zederhaus. Once the flower ornaments are finished, they are carried to the local church in a procession and remain there until the flowers have withered. We have described the custom of the Prangstangen in Muhr and their alleged origin in a grasshopper pest in our article on customs and traditions in Salzburg. Therefore, we will not elaborate on it any further. Muhr is also one of the Lungau communities that still do Samson processions or parades. Muhr is not a skiing village. Tourists come to Muhr mostly on day-trips for the events mentioned before or for hiking holidays. Note that Muhr lies within the National Park Hohe Tauern. Historically, Muhr has been a mining village (for gold and arsenic ore). Today, it is local service industries, agriculture and a bit of tourism that keep Muhr going. For international visitors, Muhr is an off-the-beaten-track destination with nice hiking routes and good outdoor experiences.